The changes to the environment in the Arctic–the Arctic Ocean as water and ice, its air, its surrounding land, and its plant, fish, animal and human life–revolve primarily around changes to the extent of sea ice. The findings are consistent: the extent of sea ice is declining, including multi-year ice. An additional concern is Arctic amplification– the concept that less sea ice is self-reinforcing, as more sunlight is absorbed by ocean water instead of being reflected by ice cover–may already be underway. 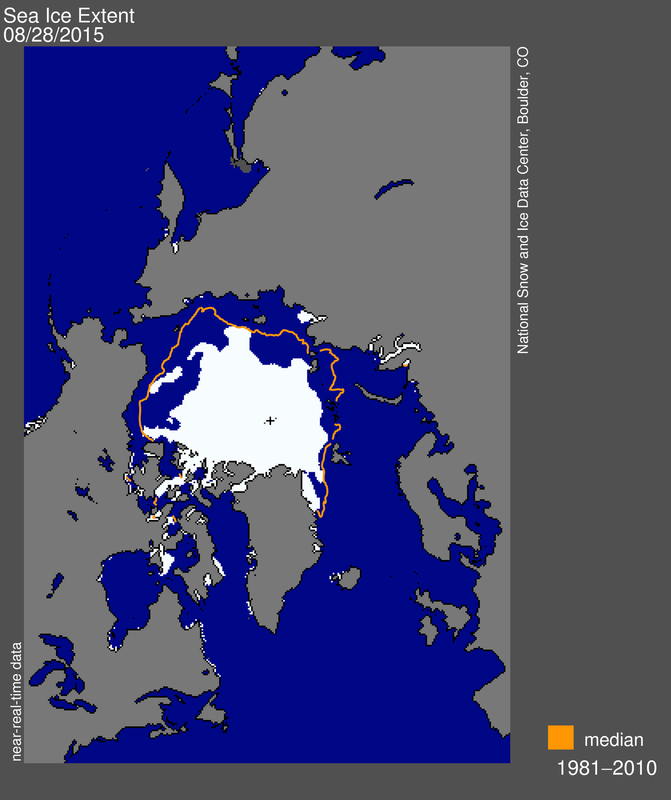 2015 Sea Ice Extent is far below the 1981-2010 median. The decrease in sea ice is already impacting Arctic animal life, indigenous peoples, and scientific, industrial and tourism traffic–from oil and gas exploration to the annual North Pole Marathon. In recent years, the polar states have increased their patrols on training, research, emergency response, and border protection missions. In the last ten years, scholarship on the politics of the Arctic has surged–not only on the environment but on the region’s history, people, politics, economics, and security questions. States and others interested in the Arctic region have built a number of governing agencies. The UN’s Law of the Sea Treaty applies rest-of-the-world rules to the region’s natural resources. The UN’s International Maritime Organization deals with shipping and environmental concerns. Arctic-specific structures start with the Arctic Council, founded in 1996 and now comprised of eight member states and a number of indigenous peoples organizations. States, sub-state units, and indigenous populations have also formed more localized bodies such as the Barents Euro-Atlantic Council, Nordic Council of Ministers, Northern Front, and Northern Forum. The 2008 Ilulissat Declaration emphasized the leading role of states. The United States has issued two recent policy documents on the Arctic: at the end of the Bush administration in 2009, and from the Obama administration in 2013. Earning considerable criticism in August, President Obama permitted Shell to drill in the Chukchi Sea. Meanwhile, Russia has called the Arctic central to its security interests, and China is building ice-breaking ships. What Models for the Arctic? Combined, these geopolitical questions and governing structures make the Arctic region not “ungoverned” but “under-governed.” At the GLACIER conference and in the future, the Arctic is likely to develop into one the following models: development first, international agreement, unilateral universalism, continuing contest, and imminent danger. Development First. In ungoverned or under-governed regions, opportunities often take precedence over possible challenges, risks or negative impacts. The prospect of economic benefits drives policy; indigenous cultures, environmental costs, and political risks are given less regard. Development first is a common pattern with some familiar examples. Productive examples include the development of agriculture in Australia and Argentina. Extractive examples range from copper in Chile to gold in California and diamonds in Africa. Cases that are more combative and destructive include the seizure of gold from the Aztecs and Inca, the near-extinction of the North American bison, and the African slave trade. It can also result in unintended consequences, as with poverty reduction programs that contributed to the partial clearing of the Amazon rainforest. Development first is a potential model for the Arctic in very traditional ways. Its natural resources (oil and gas, minerals, fishing) and commercial sea routes are coveted by states and industry in a competitive global political economy. International Agreement. A second approach to under-governed spaces is international agreement–like in the Arctic’s polar opposite, the Antarctic. Antarctica, without a native population and not part of potential commercial traffic, is governed primarily by the Antarctic Treaty (1959) and other agreements under the Antarctic Treaty System, committing signatories to peaceful activities only. It authorizes freedom of scientific research, prohibits military activity, nuclear testing and radioactive waste, specifically does not recognize (nor dispute) states’ territorial claims and precludes additional claims, and establishes annual Antarctic Treaty Consultative Meetings (ATCM). The 1991 Protocol on Environmental Protection to the Antarctic Treaty emphasizes the importance of the protection of Antarctica’s environment, prohibits exploration or exploitation of energy or mineral resources, and promotes environmental assessment of activities, emergency response preparation, and international resolution of disputes. Additionally, the Antarctic and Southern Ocean Coalition (ASOC) is an association of environmental non-governmental organizations, and an official observer to the Antarctica Treaty System. Mikhail Gorbachev proposed in 1987 an Arctic “zone of peace;” others have called for demilitarization or a non-state “polar park.” An international agreement model may be relevant to the Arctic if it can draw from existing resources, be adapted to its distinct geographic, biological, political and economic traits – and if signatories can remain motivated to comply. Unilateral Universalism. A third approach to existing and potential Arctic trading routes is based on transit free from economic, political, or military hindrances. The sea routes over Russia and through Canada are each predominantly under the geographical shadow of one state but subject to the interest of many, like the Panama Canal today. The Panama Canal opened in 1914, shaved some 8,000 miles off the 14,000-mile Cape Horn route from New York to the U.S. west coast, and greatly shortened European and Asian routes as well. Under U.S. control, the Canal met its maritime goals for the United States and for global commerce, and U.S. military interests shortening the travel time between its Atlantic and Pacific seaboards. It retains its importance today under Panama’s control. By comparison, the world’s other most important shipping straits today do not paint an entirely rosy scenario for Arctic potential. The historical difficulties with the Suez Canal, and the current challenges in the Strait of Malacca, illustrate political, economic, safety and environmental risks. But perhaps none are as important or as precarious as the Strait of Hormuz. Imminent Danger. Critical oil shipping flows from Persian Gulf through the Strait of Hormuz to Western Europe, Asia and the United States. Between Iran and the Arabian peninsula the Strait is vulnerable to small or large efforts at traffic disruption. There is no easy substitute for the oil flow. The global economy could face immediate, severe damage if a state or non-state actor were able to impede traffic or even briefly close the Strait. If Arctic shipping and resource exploration are to expand, and if the environment and indigenous communities are to be protected, the most critical effort is the avoidance of military conflict in the region. There is no evidence at this time that such a scenario is likely, but increased military presence, border disputes and potentially large economic stakes could lead to escalating conflict. All parties must remain motivated and committed to avoiding such a path. Continuing contest. Short of direct military conflict or the imminent threat of it, another future scenario for the Arctic is ongoing competition. This condition has the chance of armed conflict but the predominance of political and diplomatic discord. Throughout history, the Bosporus Strait, the Mediterranean Sea, the Baltic Sea and others have held this condition–like the Caspian Sea today. 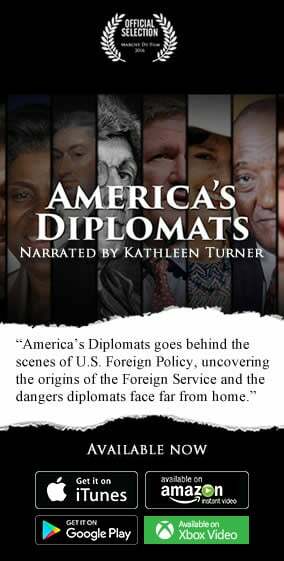 In some sense, this combines elements of the preceding logics: development, diplomacy, and security risks. Increased human activities will continue to influence the Arctic. Nation-states with competing interests have begun to prepare for the opportunities and potential conflicts. Policy choices, environmental changes and technological advances will continue to influence each other. The GLACIER conference is a step along, not a resolution to, states and others shaping the Arctic’s future.